That doesn’t mean you should shoot it also. After remembering how camera brand religious wars are waged, I am reminded of this outdated article I wrote—not really that outdated. They’re not taking the photo, you are. Grow a pair; make a choice—it’s your choice, not theirs. …and that advice never will be outdated. “The best camera to have is the one you have on you.” is the best piece of advice I’ve ever received about photography and is why my camera lives in my rucksack (or rolling around in the passenger footwell) rather than a special photography bag at home. 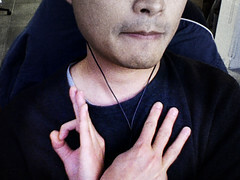 Andrei says we need a Nikon D3 gang sign.